PEO TV, the entertainment arm of Sri Lanka Telecom launched “HELAWOOD POPCORN”, a new virtual space to discuss and explore ‘now’ and ‘then’ of Sri Lankan cinema at Tharangani Cinema Hall on January 23rd, 2019. PEO TV originated its Cinema Story from the inception opening up a TV platform for local films and productions and initiated a collection of most popular local movies for our viewers. The launching ceremony brought together our very own veteran and prominent film directors, producers actors, critics and others and the Chief Executive Officer of PEO TV shared his views on the background and the evolution of our cinema. The veteran cinematic critic Ajith Galappaththi’s narration on “Sinamawe noliyawunu katha” (The unwritten stories in cinema) shed light on various undisclosed areas and incidents of our contemporary cinema. He also emphasized on the importance of taking forward our cinema to the next level. 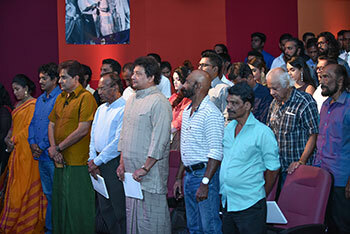 The open discussion participated by veteran actors and actresses including Sanath Gunathilleke, Nadeeka Gunasekara, Roshan Pilapitiya and Neranjani Shanmugarajah focused on the emergence and the decline of various eras in our cinema and it received much attention from the audience. The highlight of the ceremony was the felicitation of Daya Wimalaweera, Wilson Karunarathna and Latha Walpola for the contribution they made to their respective fields in acting and background singing which was organized under the guidance of the Chairman of Sri Lanka Telecom Kumarasinghe Sirisena. This latest step by PEO TV will be instrumental in building prominence towards local cinema, within its own ‘Home Box Office’ by taking the masterpieces to the viewers’ doorstep re-generating returns for movies produced locally. The ‘Helawood Popcorn’ will be an ideal destination to engage, share your views and discover the possibilities for the betterment of local cinema.